The Pax wine bottle with dipped-in-wax top,opens easier than I thought. Just screw into it with your wine opener and pull out as normal, the top pops off. I know I should wait a couple years to drink any of the 2004 Pax, but I can't. I have no time or space to store it, and I have no money to buy anything else to drink. It's good. Not too hot, total balance. Northwest Italy looks cold as I watch the Olympic coverage (hate NBC's coverage btw), I'll be very close to that area as I'm going to visit the Lange hills and Asti to learn more about Piedmont. I'm leaving Napa and the winery in one month and need to move my stuff to storage. Where will I live and what will I do? Frankly Mary Ann, I give a damn and am having mini panic attacks every day. This is the reality of living out a fantasy. It's a lot different drinking wine from the bottle versus sticking my head/lips in the tank... ? The first phase of bottling our Sauv Blanc ended today. I learned how to fill propane tanks this week. Pretty day, after all the pruning has taken place in Napa we are left with piles of sticks to burn. Through the beautiful blue skies you can see and smell the smoke of last year's vines in small fires across the valley. It's been very warm for the last six days, tonight it's getting cold. 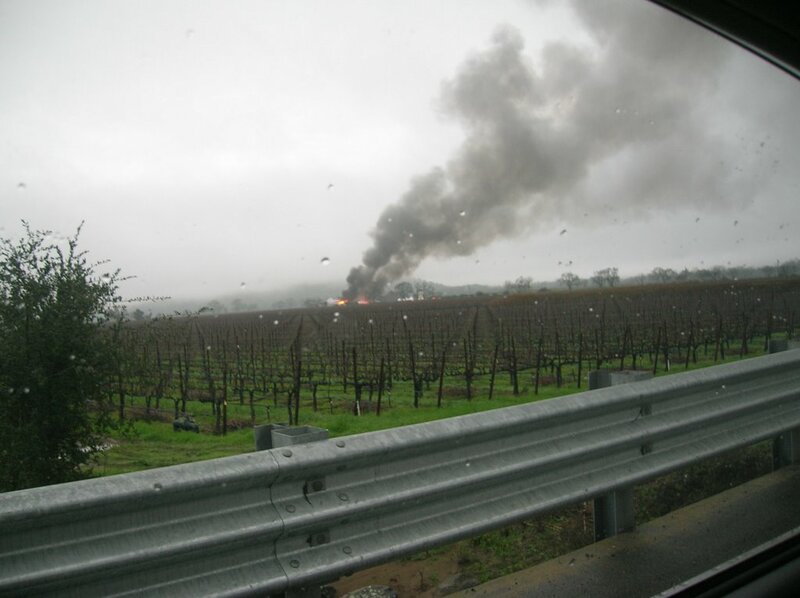 There was a fire this morning at Silver Oak Winery. This pic is from my view on Oakville Cross Road looking south. The winery is getting ready for a release party this weekend, I'm told they usually make a million in sales from the event. I've not heard any details about the cause or damages.